If you want to absolutely separate yourself from other Polaris Slingshot owners.. an Air Ride Suspension Kit is the way to go. 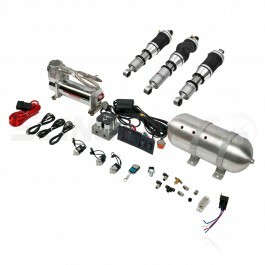 Besides, your Slingshot looking amazing layed out on the ground.. you also enjoy air ride benefits such as: Adjustable Ride Height, Variable Spring Rate, Improved Ride Quality and Push Button Control. 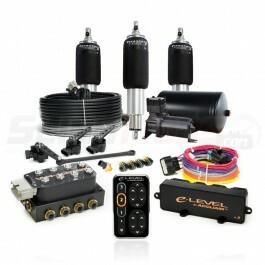 Unlike other "generic" air ride kits offered online for the Polaris Slingshot.. the kits we offer are "complete" air ride suspension kits... meaning when you buy from Slingmods you can rest assured that we're including every single component you'll need for a complete turn key air ride suspension upgrade. 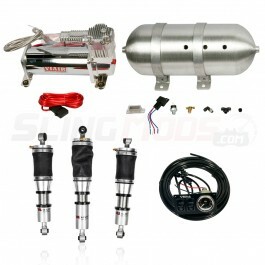 The air ride kits are Made in the U.S.A. using Ridetech components and the shocks come backed with a 1 million mile warranty. You'll also have the ability to select your air tank location depending on your personal preference. 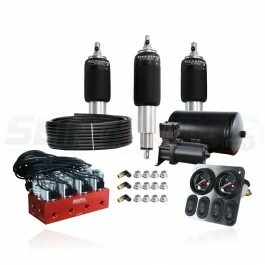 Every Air Ride Suspension kit we offer includes free shipping anywhere in the U.S.A.